UC DAVIS / U. MARYLAND (US) — As Obama and Romney square off in their first debate tonight, college students across the country will try out a new app that could make live polling possible for the first time on a large scale. So far more than 175 political science professors nationwide have registered some 12,000 students to field test the real-time polling app, developed by researchers at the University of California, Davis, the University of Maryland, and the University of Arkansas, Little Rock. Along with at least six other universities around the country, UC Davis will hold a debate-watch event for app testers on Wednesday. About 100 students are expected to participate in the UC Davis event, at which they will be able to view nationwide app responses on a separate screen as they tap out their own reactions on their phones. The other universities planning Wednesday debate-watch events for app users are the University of Denver, which is hosting the first debate; University of Maryland, College Park; University of Arkansas, Little Rock; Hamilton College (in New York); University of Texas, San Antonio; and University of Texas, El Paso. In addition, thousands of students at UC Davis and around the country are expected to test the app in their dorm rooms, apartments, and other locations. Field-testing will continue throughout the three scheduled 2012 presidential debates, as well as the vice presidential debate. The app, released to students in a limited quantity for the first debate, will allow viewers who sign in on their phones or computers to use button taps to register agreement or disagreement with candidates’ arguments. App users will also be able to signal when they think a candidate is spinning a fact or dodging a question. Students will be asked pre- and post-survey questions intended to collect demographic information and to help measure changes in attitudes toward the candidates during the debates. Boydstun hopes the app will help to engage the Facebook generation in politics, and has developed a variety of teaching resources for instructors to use in talking with students about the debate. In the future, the app could also be used to get instant reaction to other types of live events, from state-of-the-union addresses to football games, Boydstun says. Boydstun developed the app with Philip Resnik, a professor of linguistics and computer science at the University of Maryland; Rebecca Glazier, an assistant professor of political science at the University of Arkansas, Little Rock; and Matthew Pietryka, a lecturer and postdoctoral fellow in political science at UC Davis. 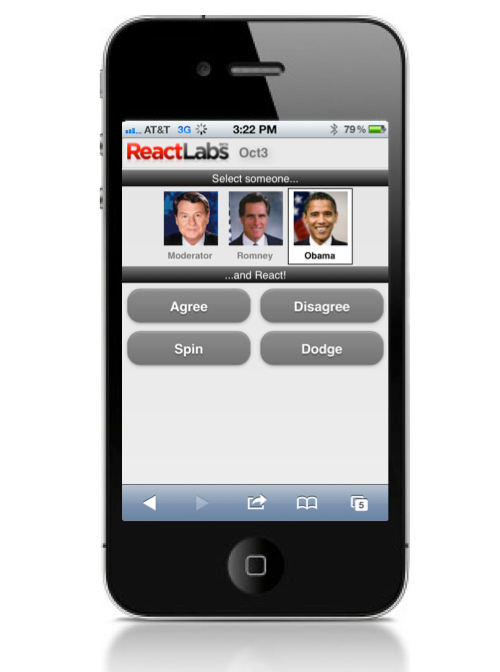 Resnik developed the React Labs real-time polling technology in his research at the University of Maryland. He also formed a startup company to commercialize it, but the technology is not yet available for public use, he says.